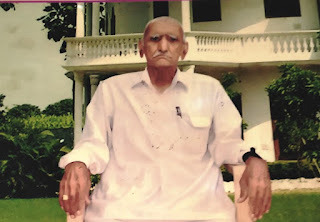 Sr Journalist Amar Singh Jyani Bereaved – His Father Ami Chand breathed his last on the night of 15th January. Sr. Journalist Amar Singh Bereaved – His Father Ch Ami Chand Jyani breathed his last on the night of 15th January. His funeral will be held in his ancestral village Sirdhan in District Fatehabad on Wednesday 16th January 2019 at around 12 NOON. Amar Singh Jyani is a staffer with India News Haryana and is an Ex-Air Force Personnel. He is also a regular contributor to the newsfeed of SirsaNews. Sirsa News sends condolences on this loss to Amar Singh Jyani and his family. For Location Click Sirdhan above. Jyani Family will be sitting for condolence meetings at their Village Home in Village SIRDHAN, Distt Fatehbad till 27th January. The Rasm-Pagri will be held on 27th January Before Noon at their home in Village Sirdhan itself. Village Sirdhan is about 11Km from Fatehabad (NH9) on Bhattu Road via Dhingsara. The Word Sirdhan is hyperlinked in the text above for Google Maps Navigation for Those who use GPS Navigation.